Zhenjiang Research Institute of Building Science (ZRIBS) in China is a certificated national laboratory and national metrology testing institution. To supplement their building acoustics testing, they employ NTi Audio solutions. NTi provided them with technical support training. During the training, Ention Xian, product manager of NTi Audio, introduced the basic principles and national standards about sound insulation, such as airborne and impact sound, to the engineers. He further demonstrated practical testing methods and workflow. NTi Audio makes it easy to measure sound insulation. Once the devices are set up, one can do all the tests with a simple click in the Sound Insulation Reporter software. This brings an end to complicated setups and data acquisition. XL2 Sound Insulation Reporter is a PC-based software application that provides all the standard reports for airborne, impact and facade sound insulation measurements. Designed for acoustic consultants, this comprehensive tool uses data gathered by the XL2 Acoustic Analyzer, and returns graphical analysis of all measurement positions. Further, the Dodecahedron Speaker Set provides a powerful signal source for room & building acoustic measurements. The optimized frequency spectrum delivers a high level of equalized sound energy. The PA3 Power Amplifier, with built-in noise generator, provides the test signal. Played through the light-weight Dodecahedron Speaker, an omni-directional, flat acoustic frequency spectrum is produced. The XL2 Acoustic Analyzer measures the noise spectrum in the sending and receiving room as well as the reverberation time. Spaghetti cables are a nightmare to field engineers. Now with the sound insulation set from NTi Audio, this is a thing of the past. Using wireless - just like connecting to a WiFi - you can put all the test instruments and your PC in the same LAN and control the instruments remotely. During the measurement, the only thing you need to do is move the devices to the planned measurement points and press the start button on the PC. Measurement results show on the screen directly after the measurement is completed. Bin Sui, director of ZRIBS commented:" NTi Audio provides a complete solution which saves us a lot of time with no compromise in accuracy. I appreciate their excellent technical support. From the explanation of the operation of an individual device to the complete practical measurement process, they provide detailed training and user guides." 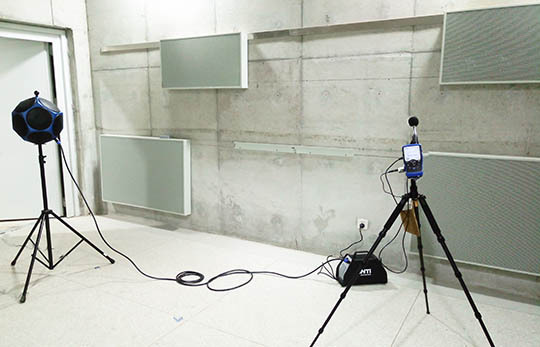 NTi Audio's building acoustics measurement solution has gained a good reputation in the field. All XL2 owners can install the corresponding options to access complete building acoustic measurement capabilities.